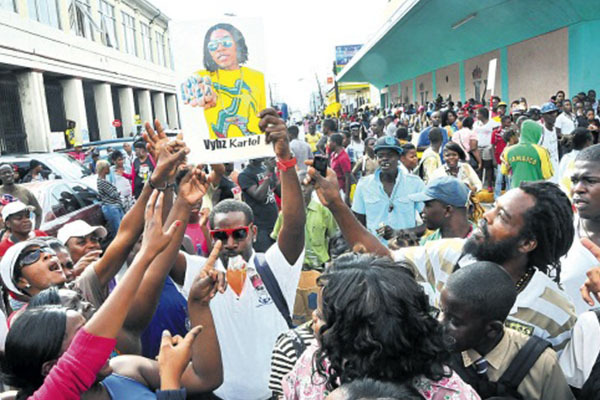 Jamaica (CMC) — THE look on the face of entertainer Vybz Kartel when his guilty verdict was handed down yesterday said it all. The deejay, whose real name is Adidja Palmer, appeared drained and forlorn as he seemed to try to come to grips with the fact that he could be spending more than two decades behind bars for the murder of Clive ‘Lizard’ Williams. His eyes were reddened, and as reality sank in, he stared blankly. He has already been locked away for close to three years. Sitting beside him was co-accused Shawn ‘Shawn Storm’ Campbell. He, too, seemed as if the wind was thumped out of him, even as he tried to show a brave face. However, his pain was evident. As the jury foreman stood and read out the verdicts at the prompting of the court registrar, Kahira Jones bowed his head slightly while Andre ‘Mad Suss’ St John maintained the poker-faced look he carried throughout the trial. Both co-accused were also found guilty of murder. In contrast, Shane Williams, who was found not guilty, was obviously relieved but still seemed to hurt for his friends who were taken back to New Horizon Adult Remand Centre without him. “Mr Williams, the jury having not found you guilty, the charge against you has been dropped. You may go,” Justice Lennox Campbell told the young man. An elated Everton Dewar, who represented Williams and maintained his innocence throughout the gruelling 65-day trial, said justice had been done for his client. “My client has been in custody for 30 months and has finally got some justice. He needs some psychological treatment due to the time he spent behind bars,” Dewar said. The jurors deliberated for one hour and 53 minutes after retiring to the jury room at 3:44 pm. But when they returned to the courtroom and indicated that they had reached a verdict by a margin of 10-1, lead prosecutor Jeremy Taylor indicated to Justice Campbell that the regulated two hours for the court to accept a majority verdict had not elapsed. Justice Campbell then instructed the jurors to return to the jury room and further deliberate. About nine minutes later, Justice Campbell, flanked by four bodyguards, re-entered the courtroom and minutes later the jurors filed in. In front of a packed room which saw cops, members of the legal fraternity, members of the public and a battery of reporters eagerly awaiting the verdict, the announcement was handed down. Justice Campbell then congratulated the jurors for their unflinching service to country and lauded them for their bravery. “Madam foreman and your members, I would like to thank you for your responsible and serious approach. This is one of the longer cases that I know of in this jurisdiction. Thank you, on behalf of the Jamaican people, for serving and serving well,” Justice Campbell said. “You could not have done anything else on the evidence presented here; it was not possible,” he added. Also in attendance was Director of Public Prosecutions Paula Llewellyn. Llewellyn said the verdicts were a boost for justice in the country and praised the bravery of star prosecution witness Lamar Chow, who gave up his freedom to go into the witness protection programme and give evidence against his former cronies. “I cannot but speak highly of the main prosecution witness. One would not appreciate, unless you are in the trenches, how difficult it is in cases of this nature to convince civilian witnesses of giving evidence. Mr Chow was very courageous, but I must confess that between the police and the prosecution we had to be very innovative to track him down,” she said. Earlier, Justice Campbell instructed the jurors to disregard claims by the defence that Chow had penned a letter to the Office of the Public Defender that he did not willingly come forward and had in fact seen Clive ‘Lizard’ Williams after the evening of August 16, 2011 when police accused the five men of bludgeoning him to death inside a house owned by Vybz Kartel in Havendale, St Andrew. He said the date of the letter also pointed to doubt. “He has denied writing the letter. What is before the court is, at the time this letter was written he was in protective custody,” the judge said. Justice Campbell also instructed the jury that the accused men had a legal right not to take the witness stand and give unsworn statements instead and they should not be found guilty based solely on that action. “Could it be that the accused could be reluctant to put his evidence under the scrutiny of cross-examination? If so, why? He could be protected from unfair questioning by counsel or the court. It is a matter for you to make up your mind if the unsworn statement has any value,” he said.